Description: Commonly referred to as string beans or french beans, green beans are known for the sweet flavor from the outer pod. 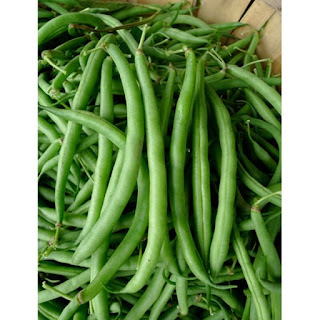 Green beans belong to both the same genus and species as black beans, pinto beans, and kidney beans and there are over 130 known varieties of green bean varying in pod color amongst many other traits. They are often boiled, stir-fried, or even turned into a green bean casserole. . Kitchen Pharmacy: Green beans have shown to promote good cardiovascular health and their high levels of flavenoid help reduce birth defects. In addition, green beans have been linked to strong immune systems as well as helping prevent type 2 diabetes.